Recently, VoxEU has published two related articles on bank competition. Marquez-Ibanez and van Leuvensteijn (2017) found that, when competition increased, banks with higher levels of securitisation became riskier. van Leuvensteijn et al. (2016) showed that in an environment with binding interest rate ceilings and floors, like the Chinese banking sector, traditional measures of competition may be biased while the ‘Boone indicator’, a new measure of competition, provided reliable estimates. In the same line of research, in a recent paper we study the impact of changing regulatory regimes on banking competition in Italy (De Bonis et al. 2018). We use a unique data set of 125 years of bank balance sheets, from 1890 to 2014. The 'free-banking era': This characterised Italy from 1890 through the 1920s. A restrictive regulatory regime: This was introduced in the 1930s as a reaction to the Great Depression, which remained mostly unchanged until the 1970s. Bank deregulation and liberalisation: This period started in the 1980s. Competition plays a major role in economic theory, but there is no consensus on how to measure it. Like Marques-Ibanez et al. (2014) and Xu et al. (2013), we primarily use profit elasticity with respect to marginal costs, the indicator that Boone et al. (2013) proposed. The rationale behind the Boone indicator is that, when competition increases, less efficient firms (for which costs are higher) are more harshly punished – in terms of lost profits and market shares – than efficient ones. The profit elasticity can be estimated by regressing profits on marginal costs. This coefficient should be negative, and the higher the elasticity (in absolute value), the stronger the competition. Given the restrictions of the long-run horizon of our research, we approximate marginal costs by average costs. We also compute the elasticity of market shares with respect to average costs (a similar indicator of competition proposed by van Leuvensteijn et al. 2011), long-term estimates of the Herfindahl index, the price-to-cost-margin, and bank turnover rate. Figure 1 shows our estimates of bank competition using the Boone indicator from 1890 to 2014. The dashed line is the estimated elasticity, with respect to costs, of either net profits (Panel A) or market shares (Panel B). The dotted lines indicate the extremes of the confidence interval at the 95% level. The solid red line is a smoothed Boone indicator, to yield a more intuitive representation of trends in competition. As expected, the Boone indicator is negative in most years. The higher the elasticity in absolute value, the greater the competition. Note: Estimates use banking average total costs until 1962 and average operating costs thereafter. Data not available from 1974 to 1976. Competition was high in the free banking era: Until the 1920s, barriers to entry were negligible, as the lack of supervisory controls meant that banks were free to constitute and to open branches. As the numbers of banks and their branches rose, competition increased and remained extremely high until the mid-1920s. There were more than 4,000 banks, the greatest number in Italian history. Competition declined during the restrictive regulatory regime: The trend reversed at the end of the 1930s, when banks’ market power increased because of the restrictive banking regulation introduced to ensure financial stability after the Great Depression. The Bank of Italy was endowed with greater discretionary power. It could decline to authorise bank creation and branch openings as well as M&A operations, and could revoke the license of any bank with insufficient capital. There were restrictions on the areas in which banks were allowed to operate. Banks were also required to join a bank cartel that set caps on deposit interest. Most of the banking sector became state owned. During this era of 'financial repression' (McKinnon 1973, Shaw 1973), there was a low degree of competition, as measured by the Boone indicator. This is confirmed by the bank turnover rate, which drops from approximately 6% to 3%. The new equilibrium, strongly influenced by the Bank of Italy's supervisory activity, was characterised by few entries, few exits, and few M&As. Competition increased with deregulation: With the take-off of the deregulation process in the 1980s, the banking system moved toward a more competitive framework. Barriers to competition were gradually removed, the bank cartel was abandoned, clear rules for the authorisation of branch openings were established, geographical constraints on lending were cancelled, and the prohibition against commercial banks providing long-term loans was weakened. The liberalisation process experienced a boom in 1990. Branch openings were deregulated, state-owned banks were authorised to become public companies, and parliament passed the first Italian antitrust law. In 1993, a new banking law reorganised all the regent regulatory changes in a pro-competitive framework. In this framework, bank creation was free and markets were no longer segmented. The effectiveness of the deregulation process is confirmed by our estimates of the Boone indicator, which signal an increase in competition since the 1980s. The turnover rate also began to increase in the second half of the 1980s as bank creation was liberalised. This trend accelerated at the beginning of the 1990s, when turnover increased further owing to M&A activity. Competition declined during the 1990s: The yo-yo pattern continued with a return to decreased competition in the second half of the 1990s (see van Leuvensteijn et al. 2011 for a similar trend). This reduction was less pronounced using the indicator based on market shares. The decline in competition ended in the early 2000s, and the extent of competition remained stable during the long Italian recession of 2008–2014. 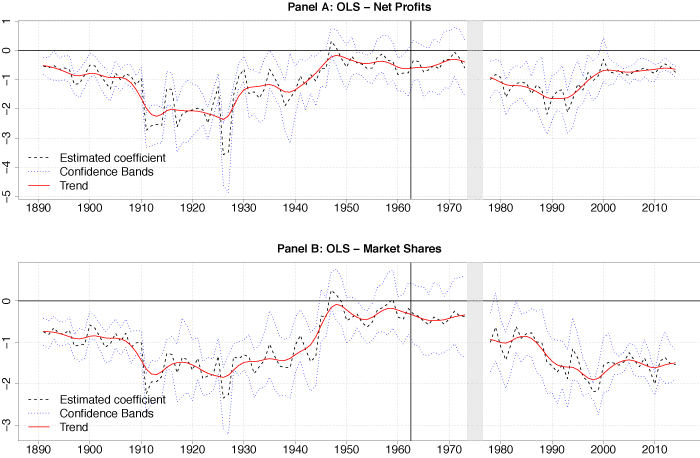 In our paper we also provide other micro-econometric results showing that changes in competition were influenced by changes in regulation, confirming that the institutional framework of the financial repression period was the most hostile to competition during the past 125 years. Our evidence shows that the evolution of regulation itself has been an important driver of competition. This confirms that the financial sector does not change monotonically over time (Rajan and Zingales 2003). Additional research would be needed to assess the effect of regulation on banking competition in other countries that, like Italy, have experienced swings in banking regulation. It would also be worthwhile to compare the variety of actions undertaken by banks during the Great Depression and the Great Recession. We leave these issues for future research. Authors’ note: The views expressed in the article are those of the authors and do not necessarily reflect those of the Bank of Italy. Boone, J, J van Ours, H Wiel (2013), “When is the price cost margin a safe way to measure changes in competition?”, De Economist, 161(1): 45–67. De Bonis R, G Marinelli, and F Vercelli (2018), “Playing yo-yo with bank competition: New evidence from 1890 to 2014”, Explorations in Economic History 67: 134-151. Gigliobianco, A and C Giordano (2012), “Does economic theory matter in shaping banking regulation? A case-study of Italy (1861-1936)”, Accounting, Economics, and Law: A Convivium, 2(1): 1-78. Guiso, L, P Sapienza and L Zingales (2006), “The cost of banking regulation”, NBER working paper 12501. Marques-Ibanez, D and M van Leuvensteijn (2017), “Bank competition and financial stability: The role of financial innovation”, VoxEU.org, 3 February. Marques-Ibanez, D, Y Altunbas, and M van Leuvensteijn (2014), "Competition and Bank Risk: The Effect of Securitization and Bank Capital", European Central Bank working paper 1678. McKinnon, R I (1973), Money and Capital in Economic Development, Brookings Institution. Rajan, R G and L Zingales (2003), “The great reversals: the politics of financial development in the twentieth century”, Journal of Financial Economics, 69(1): 5–50. Shaw, E (1973), Financial Deepening in Economic Development, Oxford University Press. Toniolo, G, and N White (2015), “The Evolution of the Financial Stability Mandate: From Its Origins to the Present Day”. NBER working paper 20844.
van Leuvensteijn, M, A van Rixtel and B Xu (2016), “Lessons from China on bank competition at the zero lower bound interest rate”, VoxEU.org, 12 June. van Leuvensteijn, M, J Bikker, A van Rixtel, and C K Sorensen (2011), “A new approach to measuring competition in the loan markets of the euro area”, Applied Economics 43(23): 3155–3167. Xu, B, A V Rixtel, and M V Leuvensteijn (2013), “Measuring bank competition in China: a comparison of new versus conventional approaches applied to loan markets”, Bank for International Settlements working paper 422.